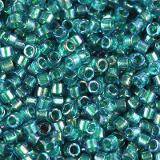 Miyuki Delica beads belong to the most popular seed beads which have got very big hole to help beading. You can easy use them with needle. 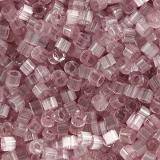 Seed beads Miyuki Delica is a Japanese brand commonly known in the world of beading and handmade jewelry. 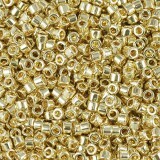 These beads are valued for their particularly high quality and durability. Many people are afraid that because of their small size, they will not be able to use them. That's why it's worth to start the adventure with bead beads from Miyuki Delica beads, instead of choosing the cheapest elements "no name". The beads of this Japanese company are perfectly even and have large holes, which helps during threading. Try it, and you'll find out that working with beads is much easier than you thought! Most importantly, the effects are amazing! Delicate, shiny bracelets in the most beautiful colors of the rainbow will delight all your friends! In our store you will find Miyuki Delica beads in light, pastel and dark colors. Additional color effects allow you to let go of fantasy. 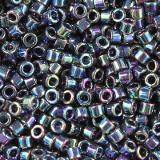 You can find transparent (translucent) beads, shiny (sparkling, luminous), opaque effect, as well as an interesting effect inside the beads (copper lined, silver lined, inside dyed). Miyuka Delica beads are certainly the most famous Japanese beads, which are one of the most valued products in the hand-made, beautiful jewelry industry. These beads were created in Japan in the eighties by Masayoshi Katsuoka from the Miyuki Shoji Company. If you love handicrafts, DIY products and original jewelry that you will delight your friends with, you must get to know them! What characterize Miyuka Delic's beads? 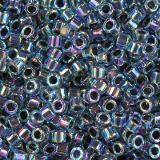 The main feature of Miyuka Delica beads is their cylindrical shape and large hole. It is this shape that makes the things created from them perfectly matched and flat. Beads are available in various colors: light, pastel and dark. Among the available types there will also be transparent, shiny, with ornaments inside or an opaque effect. Such diversity will allow you to create really unusual designs, shapes and combinations, allowing you to free fantasy leaders and create amazing jewelry that will be an ideal addition to any styling. 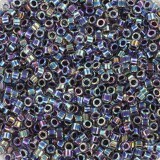 Japanese Miyuka Delica beads is a guarantee of the best quality and durability. At the same time, it ensures that your handicraft will give you joy of wearing for many years! Beading, in other words, beading. It's an English name that simply means a bead. Beading consists in working with small beads using a needle and thread, sometimes it may also be a crochet hook. This technique also includes bead embroidery. In order to start the adventure with beading, you need to buy just the above-mentioned beads, which thanks to the even openings are easy to thread, especially for beginners. You will also need thin needles, various types of thread and glue, which must be strong and colorless. Silver jewellery findings products will also be useful to finish the whole. Such a set and a little patience and quick not to be put off, at the beginning, it is enough to become a designer of delicate pendants, bracelets or pendants created from Japanese beads by Miyuki Delica. Nothing will give you more joy and satisfaction than making your beautiful jewelry yourself. It's simpler than you think!